Today I am reprinting an article written by Lee Bierer, a friend of mine, who is a nationally syndicated columnist and independent college counselor in North Carolina. Lee writes the Charlotte Observer’s weekly Countdown to College column, which is syndicated nationally to McClatchy Newspapers. I asked Lee if I could reprint her column because it reinforces what I’ve been saying for years: families should cast a wider net when they look for colleges. Here’s another way of putting it: Let’s show some imagination when devising a college list. The build-up was big, but boy, did he deliver. Robert Franek, senior vice president/publisher at Princeton Review and author of The Best 376 Colleges and The Best Value Colleges, was recently a guest speaker at Myers Park High School in Charlotte. It’s never been easier to get into college. Franek got everyone involved from the get-go. “Who here is concerned about getting into a good college?” he asked. All hands were are raised. In the Princeton Review’s Hopes and Dreams survey, everyone was united in their fear. According to the survey, the No. 1 worry for students is that they will get into the school of their choice, but won’t be able to afford it. Franek asked students and parents to write down the names of three colleges they would like to see themselves or their children attend, with the caveat that neither financial aid nor the college’s level of selectivity were factors – just where they would like to go to college if there were no obstacles. Franek gave them a minute to think and then shouted, “Cross off any Ivy League schools.” Okay, not much reaction. “Cross off University of North Carolina at Chapel Hill.” Audible moans. So what’s the take-away message? Students should have a good mix of colleges on their college list, Include a few of the usual suspects, but teenagers should try to find one or two schools that meet their criteria but don’t have as many applicants from their high school. 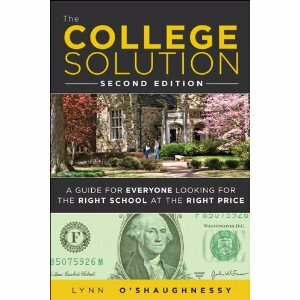 Lynn O’Shaughnessy is the author of the newly released, second edition of The College Solution: A Guide for Everyone Looking for the Right School at the Right Price. All the advice this guy gives is really great. I’m from a small town in Ohio, and outside of some elite colleges, everyone was applying to the same schools: Oberlin, Kenyon, Ohio State, Miami University, etc. When choosing colleges, I made sure to look “outside” my comfort zone. Instead of staying in the Midwest, I decided to attend a small liberal arts college in Vermont. Marlboro College has been an awesome experience, and I’ve totally fallen in love with the academic community I joined. All of my friends are stuck in huge lecture classes made up of 100+ people, while I was able to take part in a three person tutorial my freshman year with a Yale-educated professor. So look outside your comfort zone! Ivy league schools are not the only schools worth going to! Lynn, Such a great point about casting a wider net—and a reminder for families to pick up a copy of the second edition of The College Solution!!! I use a “restaurant” analogy with my client families. If everybody wants to go to the same trendy restaurant at 8 PM on a Saturday night, not everybody can get in. So you have to avoid the beaten path. Go to another restaurant that you’ve researched, but one that not everybody knows about, with not the most convenient parking, perhaps on a Thursday night. It takes a little more effort and imagination, but you’ll get in!